In the records there does not seem to be any reference to the churchyard since the very early one of 1276 until 1668, when some parishioners, having objected to paying a church rate, George, Bishop of Chester, decrees its legality and orders the levying of £26 "for Souging [soughing] and making dry the Church and Chyard of Deane." Churchwardens for 73 yards of flaggs layed in ye lowr way in Dean Church yard.£1	16s. 6d. Laying and dressing them	£1	17s. 6d." The earliest mention of an extension of the ancient burial ground appears to be in a record, dated 1796, of a "Bargain and Sale" to Rev Robert Latham for ten shillings apiece to Henry Blundell, Esq., William Hulton, Esq., and John Blackbourne, Esq., a plot of land, a part of Dean Moor, adjoining the churchyard, 3,926 square yards in extent, for the use as a burial place. And later, Rev. Robert Latham petitioned the Bishop of Chester "That by the Increase of Inhabitants within the Parish of Dean the yard of the Parish Church of Dean aforesaid being Rendered insufficient for the convenience and decent Interment of the corpses or dead bodies of persons....." and so he asks that two pieces or parcels of land totalling 4,667 square yards be consecrated. A document in the Chester Diocesan Registry Office shows, however that it was not until 1813 that an extension of the old burial ground of Saynte Mariden was carried out. A drawing is attached showing the original boundary to the south of the church. This was almost semi-circular. The additional land brought the boundary "up to the pathway from Bolton to Wigan," and took in land described as "waste" from "the Brook" to the hearse house, measuring 3,926 square yards, and also a "Part of Mifs Potters Croft," measuring 741 square yards. The curve of the old boundary to the west of the main path can readily be seen. The gravestones at the boundary's edge do not lie east and west as do the others, but follow the curve of the boundary, beyond which the ground slopes steeply towards the Clough. The dates on the gravestones also indicate the extent of the old ground. The old hearse house, which had been built on the waste land in 1727, was pulled down in 1809, and the present one built. The extent of the original churchyard on the north side of the church is marked by the first line of lime trees. The first addition to the north was in 1857, when land, somewhat less than half an acre, was enclosed by a hedge in which was planted the second line of trees. Further northward extensions followed in 1876, 1896, 1921, 1928; in 1940 part of the old vicarage garden was consecrated, and more of the old garden was added in 1956. The earliest graves of this country churchyard lay "Beneath those rugged elms, that yew tree's shade, Where heaves the turf in many a mouldering heap." and the inscriptions of the earliest stones are weathered and worn away. 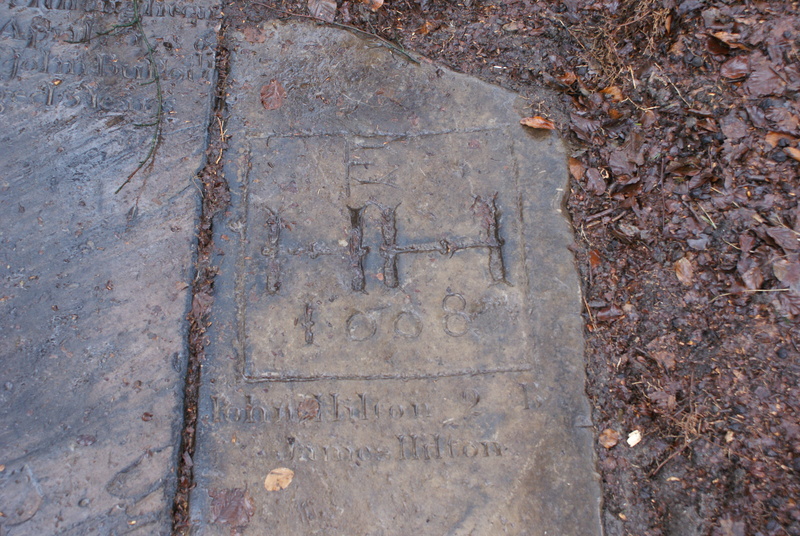 The inscription "E. HH 1608. John Hilton 2B. James Hilton," on a stone a few yards to the west of the main path and not far from the porch, appears to be the oldest in the churchyard. Glynne's "Lancashire Churches" tell us that there were formerly effigies of a knight and lady in the churchyard, but these have long since disappeared. 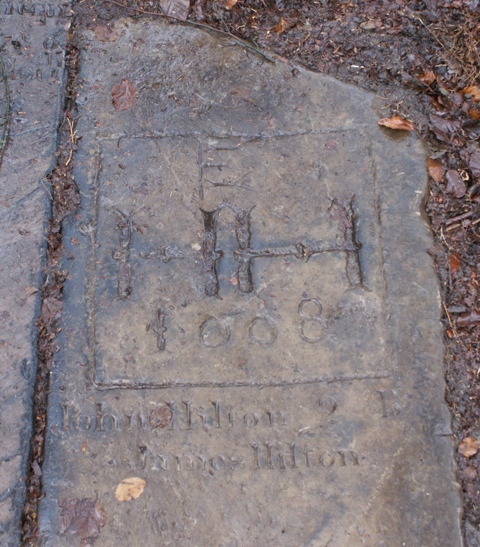 Near the Hulton door is a narrow, rough-hewn stone with a cross marked on it. Tradition claims it to be a crusader's resting place, so that if it were so it would be one of the earliest graves in this ancient burial ground. Tradition also says that the gravestone near the north-east corner of the church and several a few yards to the east with a hand carved on them, mark the graves of Huguenot glovers. Whilst there is no real evidence that the persecuted Protestants of France and Flanders came, in the 17th century, so far north as Bolton, the belief is persistent, and the Flemish wooden sabot is claimed to be the prototype of the Bolton clog. There may be some unknown connection between these graves and Huguenot settlers, but an examination of the registers does not help. The inscription on the first grave is "Rebecca Baron 1705" and the burial register records that she was the daughter of Elizabeth Baron, of Little Hulton. 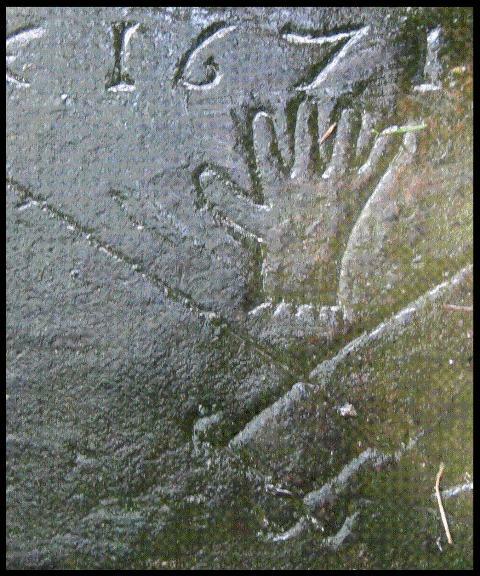 The carving on the stone represents the digit finger pointing, which is thought has some religious significance. Extensive excavation work was carried out here in 1985 to improve drainage and to drag back the soil and expose the original stonework. Several Deane vicars were buried here. The grave of John Tilsley is alongside that of his wife by the yew tree. The original stones being broken, other stones with the inscriptions reproduced have been erected over them. In the same way a second stone covers the grave of John Harpur, a contemporary of John Tilsley. Although John Harpur often described himself as minister at Bolton, the Bolton Registers describe him as "preacher of Deane," and he signed himself just before his death as "Minister of the Gospel at Westhoughton Chapel." Richard Hatton was buried at Deane; his gravestone near the south-west corner of the church names, in Latin, his three wives and three children. In the grave to the left was buried his second wife, Mary Okay, niece of the well-known Puritan, John Okay. James Rothwell was buried in the same grave as his wife in the centre aisle near the chancel. Their son Richard, at one time curate to his father and later Rector of Sephton, near Liverpool, was also buried in the same grave. Robert Latham, though buried at Wigan, is, strangely enough, commemorated on the same gravestone as Abraham Boardman, who was parish clerk, and also schoolmaster, which latter appointment was begun in the old school opposite the lychgate in 1799. This stone , next to that of Richard Hatton, is known as "the dropsy stone," the reason being evident on reading the inscription "..... Twenty three times I tapped was...."
The Hulton vault, to the west of the lychgate, has been used by the family since 1860. On other of the older stones are quaint epitaphs- such as may be found in most old churchyards.